Plantains can be prepared in several different ways, but this recipe for tostones is one of the quickest and easiest methods. It’s a good recipe for beginners who are trying their hands at cooking plantains for the first time, so even if you've never laid eyes on a plantain before, you can give it an almost fail-safe try. Cut the ends from each plantain and peel the fruits while the oil is heating. Cut the plantains into 3/4-inch slices. Fry the slices in the hot oil for 3 minutes or until they turn a light golden color and they're semi-soft. Remove the plantain slices with a slotted spoon and drain them on paper towels. When the plantain slices are cool enough to handle — about 1 minute — smash them into flat rounds. Fry the rounds in the hot oil for 3 minutes until they turn crisp and golden brown. Plantains are a staple of the Latin Caribbean diet. Part of the banana family, they're very popular in West Africa as well. They're starchier and firmer than bananas and they contain less sugar. They take a long time to ripen and aren't really edible raw until the skin has turned nearly black. They're most often used and cooked in recipes for this reason. I recommend using green plantains in this recipe, which are still unripe, but you can use yellow ones in a pinch as long as they're not too yellow — look for a slight yellow tint. Plantains are just on the verge of ripe when they turn this color. 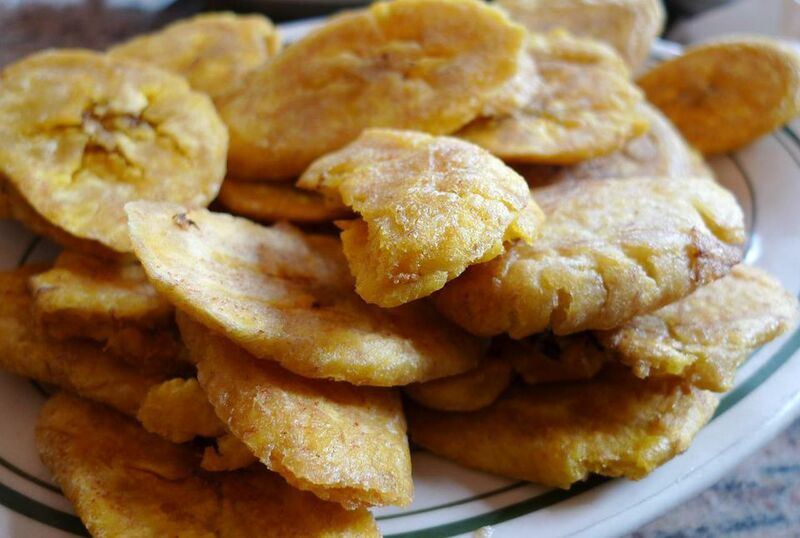 The only hard and fast rule is that you should not use ripe plantains to make tostones. It's important to maintain the oil’s temperature. Food added to hot oil tends to cool it down slightly. You can fry the plantain slices in batches to ensure that the temperature stays up at 375 F, letting the oil reheat between batches. This also helps avoid crowding the plantains and ensures that they'll cook evenly throughout. You can serve the tostones as a side dish immediately while they’re still warm or as a snack with a garlic dipping sauce. You can easily flatten the plantain slices after they're first fried by simply placing a plate on top of them and pressing down, or do the same with a large serving spoon.